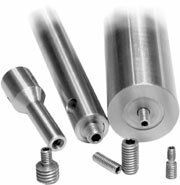 Stainless steel Mounting Posts have M4 (8-32 in imperial) and M6 (1/4-20 in imperial) holes on the ends. Components can be mounted using screws or 3AH adapters for different threads. Each post can be attached directly to a base surface using adapters 3AH. Mounting Posts could be used together with post holders 3PH. 3MP4-20 and 3SMP4-47 posts have an external M4 end. Take mirror mount 5OM111 as an example. Adjustable angle post clamps 3APC can be used to couple the posts at varying angles. Each post has a Ø6.2 hole. You use any wrench on this hole to tighten the post in a stable manner. A hex key 3HK-5 is quite suitable as wrench. 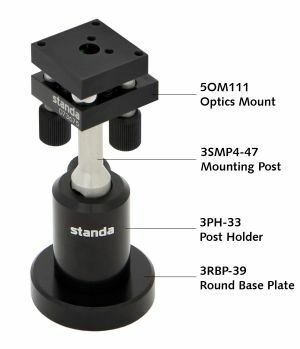 Special Mounting Post 3SMP4-47 is designed for little optical mounts, which have no space for the Ø12 mm rod. 3MP-05-3 Riser post is designed for small units.